Axiom 49, 49-Key MIDI Keyboard from M-Audio belonging to the Axiom model. Product replaced by the M-Audio Axiom 49 MKII. "M-AUDIO Axiom 49 Key MIDI"
M-Audio’s Axiom 49 MIDI keyboard controller is a great board! In my opinion, it’s probably one of the best out there. Producers who are skilled in playing piano gravitate toward this controller for the semi-weighted keys alone. I’ve seen many people from bedroom producers to long-time professionals utilize this controller in their studio, and I definitely understand, and agree, with their weapon of choice. The Axiom was my second MIDI keyboard controller. I bought it used from a user on Ebay. It served it’s purpose well and though I do not have it hooked up to use in my studio anymore, it is still capable of getting the job done should I need it again. During its time of service, I used this controller for everything from school projects, to commercial productions, and a lot of practicing, all within Logic Pro, Maschine, or a combination of the two. Before I bought the Maschine hardware, I also used the Axiom 49 to program my drums and different instruments I created using vocal samples I recorded. This board also has faders and knobs that useful for setting volumes or automation. I also would use the board to control basic functions within Logic. The Axiom 49 is very sturdy weighing six pounds. Like many boards this size, the Axiom 49 has nine faders, and rotary knobs, and eight soft drum pads. There’s also a modulation wheel and pitch-bend controller. The thing I like best about this keyboard is the semi-weighted keys. I now use a Nektar Impact controller and I wish I could take the keys of my Axiom and put them on the Nektar controller! I love the feel of playing a real piano no matter what instrument I’m actually playing. It just feels right. The faders are nice to have, but they are limited to being programmed to control one track. If you wanted to control another track you would have to reprogram it to do so. The transport bar is very convenient. Without having to go back and forth in between my keyboard and computer, I can play, stop, rewind, fast forward, cycle, and record right from my keyboard. The other thing I wish I can salvage from this keyboard is the rotary knobs. I love them because they are infinite not having a start and stop point. Because of this, I am able to automate any parameter I come across while producing and mixing music. The only board I know that offers this is Nektar’s Panorama series. The only reason I do not use this board now is because the sensor alignment for my pitch-bend wheel is off and it hinders what I play when creating music. It was so bad at one point, before I realized the real problem, I literally transposed and entire song I did song I made a while ago because I thought that key was off somehow, when in fact the pitch-bend knob was not resting in the “neutral” position when not being touched. Though I can turn it off, I am finding that I desire to use the wheel more often, but it would come at the expense of constantly adjusting. 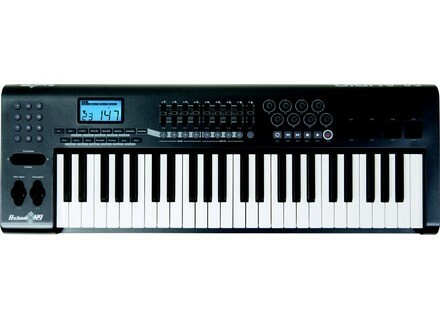 The Axiom 49 is a great controller, especially for experienced keyboard players. The price is not as competitive as others, but you will get more of the features that you need (and maybe want) by investing in this controller. Forty-nine keys may not be enough for some, but for most this board will exceed expectations.